MOV is a file format associated with QuickTime applications. To play videos on your PC with a .mov file extension you will need to download a video player that has been encoded to play that particular file type. While Windows Media Player is used for many types of files, it does not play all file types without having the right codec pack installed. Unless you happen to be a computer technician, downloading and installing a bunch of codecs and files can be quite frustrating. Read here to find top 3 ways to play MOV files on PC. This would be the official solution recommended by Microsoft. You could get multiple codec packs online to download and install for your Windows Media Player to enable your Windows Media Player to play MOV files on PC. K-Lite Codec Pack is one of the best. The K-Lite Codec Pack is a collection of DirectShow filters, VFW/ACM codecs and tools. Codecs and DirectShow filters are needed for encoding and decoding audio and video formats. The K-Lite Codec Pack is designed as a user-friendly solution for playing all your audio and movie files. VLC, GOM and Quicktime will all play MOV files. VLC is the most stable, GOM has an excellent interface and Quicktime is rock solid but may have a limited future on Windows as Apple is reportedly moving much of its functionality directly into OS-X. In order to convert your QuickTime MOV to Windows Media Player supported format quickly and easily, it's time for you to try out the professional yet easy-to-use Pavtube Video Converter Ultimate. It features a simple yet sleek interface and performs files conversion up to 6X faster enables you to complete the task in just a few clicks at your fingertips. Here we begin. Run MOV to Window Media Player, and click “File” ＞ “Add Video/Audio” or “Add from Folder” to navigate to the folder where you save the QuickTime MOV file. 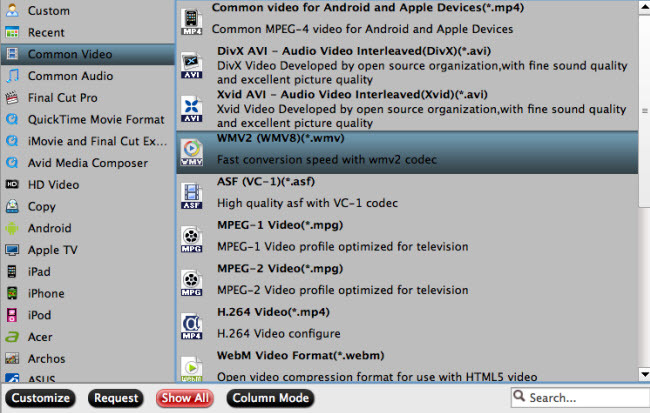 Before performing the conversion, you can edit your QuickTime MOV files and set the best audio and video parameters for the output WMV files. Then click “Browse” in main screen to decide which folder you’re going to save the converted QuickTime MOV files. At last, just one click “Convert” to get conversion from MOV to WMV started. When the conversion is over, open Windows Media Player, find the converted QuickTime MOV files and drag them to WMP for enjoyment. And you can share the converted video files with your friends who owning a Windows PC. How to transcode Samsung NX1 H.265 to QuickTime MOV on Mac Yosemite? How to Play Video on Yosemite with QuickTime Alternative? QuickTime Player Won’t Play YouTube Videos on Mac?